The Fond du Lac Amateur Radio Club, Inc is a non-profit organization. 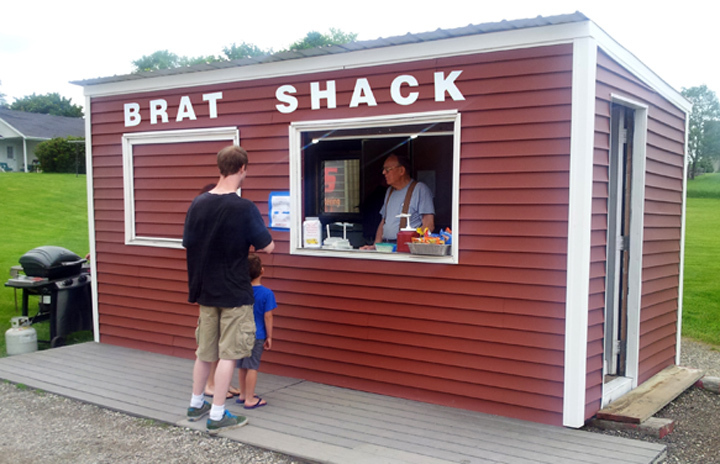 The club raises funds for its activities through member dues, donations, sales of donated amateur radio equipment, and from our semi-annual Brat Fry. Please help make our fundraiser a success by volunteering to work or stopping by to purchase some brats. We also serve hotdogs, hamburgers, chips, and soda. Club Members Jack Heil KG9IN, Lloyd Vandervort N9RPU, Peter Fox KB9WZD, and Gene Olig KD9ZP installed new aluminum siding on the Brat Shack in spring 2013. Over the years, club members have repainted the shack twice, but the siding had deteriorated to a point where new siding was deemed the best solution. Thanks to Fond du Lac Distributors for donating the siding!